Our Intermediate courses are for people who are happy paddling in force 3 wind conditions, are able to comfortably paddle 20km in a day with an efficient forwards paddling technique and can maneuver their kayak where they want it to be most of the time. Ideally you will have a knowledge of how to rescue a capsized kayaker and how to be rescued, you will be happy navigating in good conditions and will have some understanding of how to plan a trip. If this sounds too advanced then have a look at our Imporover Courses, or if your not sure then get in touch and we will help to fit you into the correct group. By this stage in your paddling career you will start to have more idea of what you are wanting to work on and we will look to polish and perfect the current skills you have. We will also start to develop those skills in more challenging environments and conditions. At Intermediate level we are able to access more exposed sections of coastline, complete crossings of up to 5 or 6 km and paddle in some more challenging conditions. You will be paddling one of our top of the range sea-kayaks so you can be sure the equipment you are using will be helping your learning every step of the way! 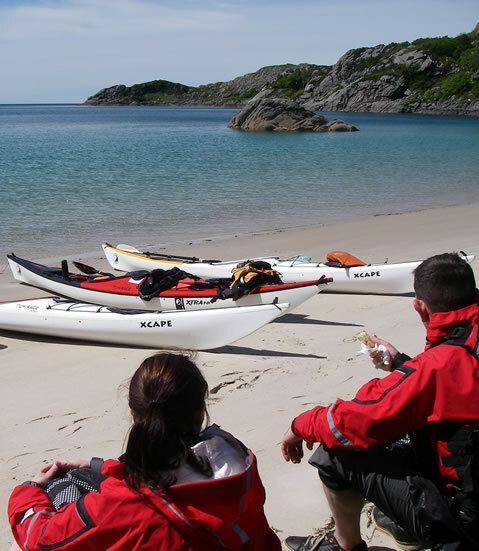 Our Intermediate Courses are normally run over 2,3 or 5 days as day trips from our base at Glenuig Inn. For Intermediate Courses we can venture out to the Small Isles (Eigg, Muck Rum and Canna), or head around the Ardnamurchan peninsula (the most westerly point on UK mainland!) when conditions allow. At this stage in your learning we will work alongside you as you plan each day dependent on the tide, the weather and the groups abilities and aspirations. This provides a relaxed learning environment where you are able to develop your confidence as an independent paddler. For more details on planned Intermediate Courses, check our dates page. We are always very flexible so if there is nothing planned which suits you already then let us know and we can plan a course around you.